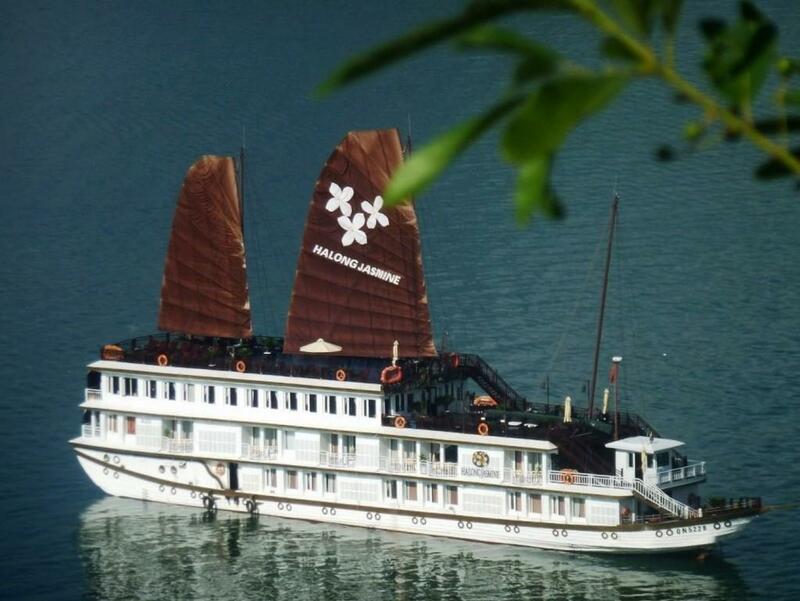 The Jasmine Cruise has been sailing the waters of Halong Bay since 2007. 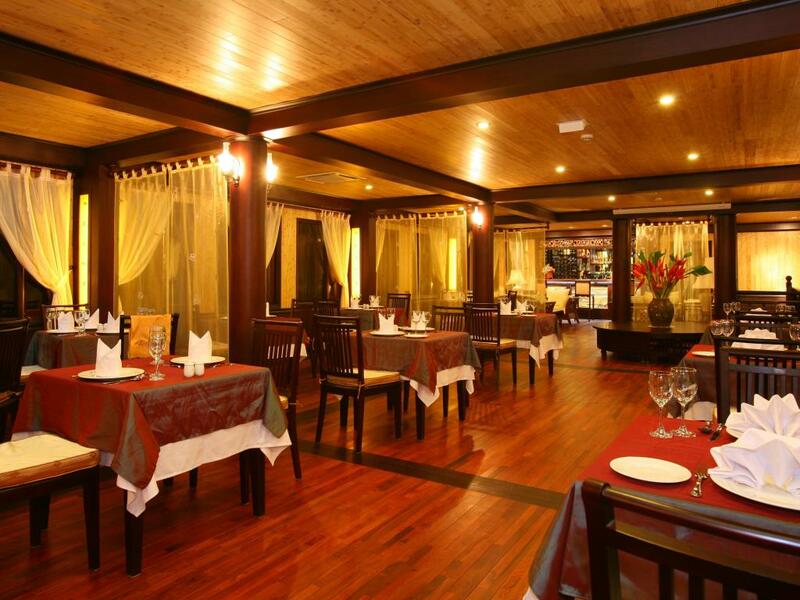 An elaborate, traditional design gives guests the “classic” Indochina experience, sending them back to the earlier years of the 20th century. While the style may be old-fashioned, the ship’s 24 cabins, on-board spa, restaurant and bar make the comforts and luxuries of modern day ever-present. 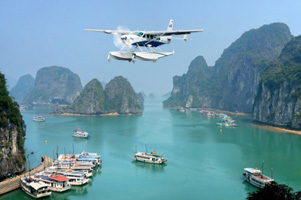 07:30 Pick up from your hotel in Hanoi old quarter then depart to Halong Bay. 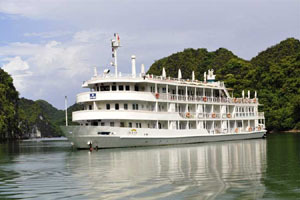 12:00 arrival Halong Bay get on board then have a great journey around Halong Bay aboard a luxurious cruise ship. 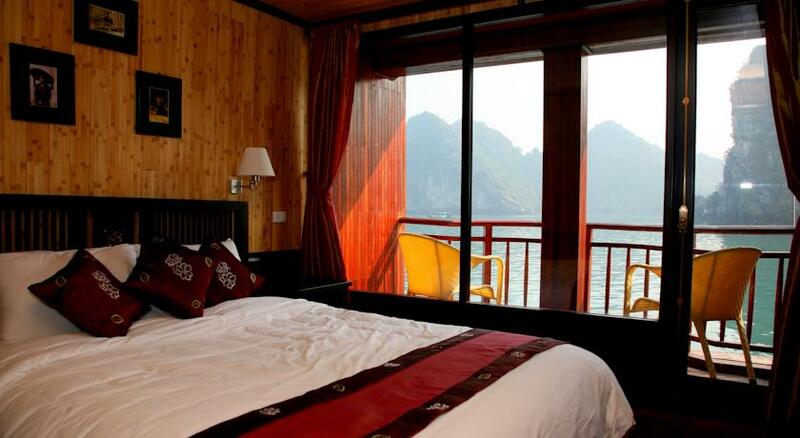 Allow your eyes to drift and float along the emerald water of Ha Long Bay. Thousands of islands and limestone formations rise from the depths of the sea like the teeth of a dragon. 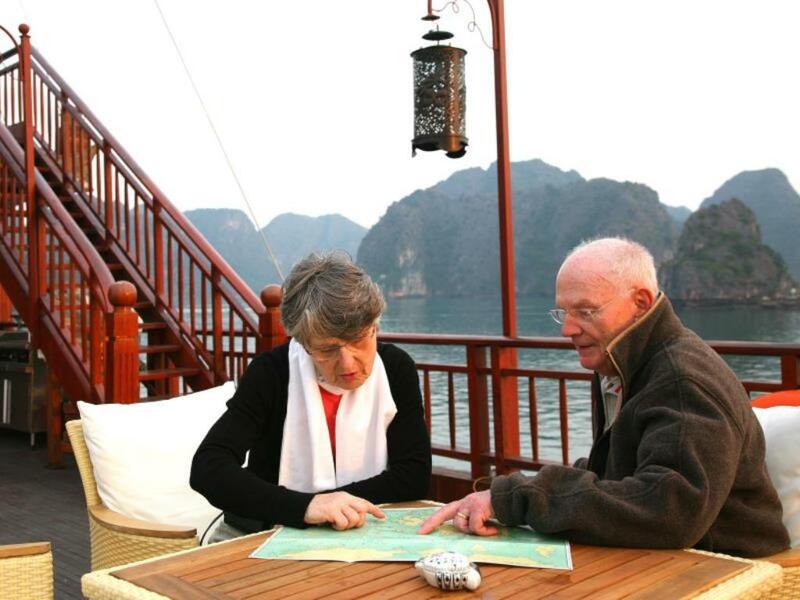 Wonder at breathtaking locations such as Am and Mat Quy islets. A scrumptious buffet lunch is waiting for you upon boarding. 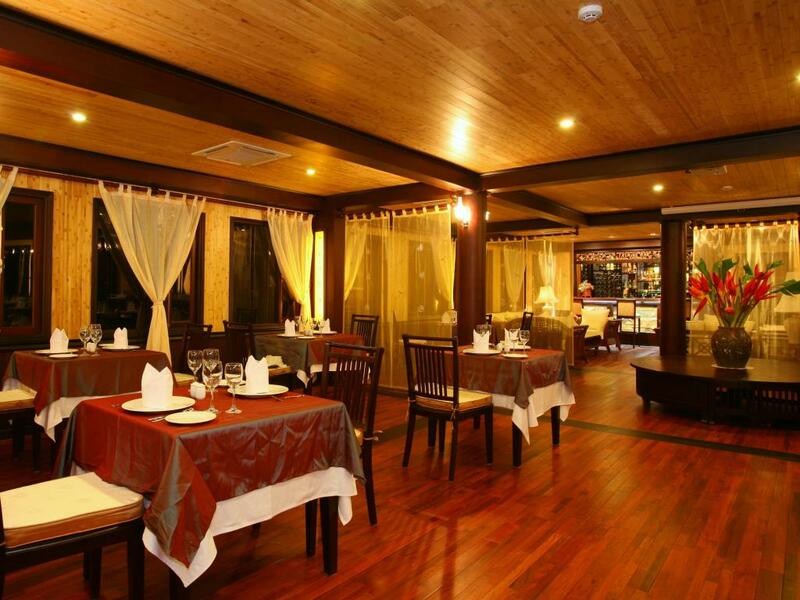 Before you indulge yourself with a delicious lunch, wander around the boat and get acquainted with its amenities. 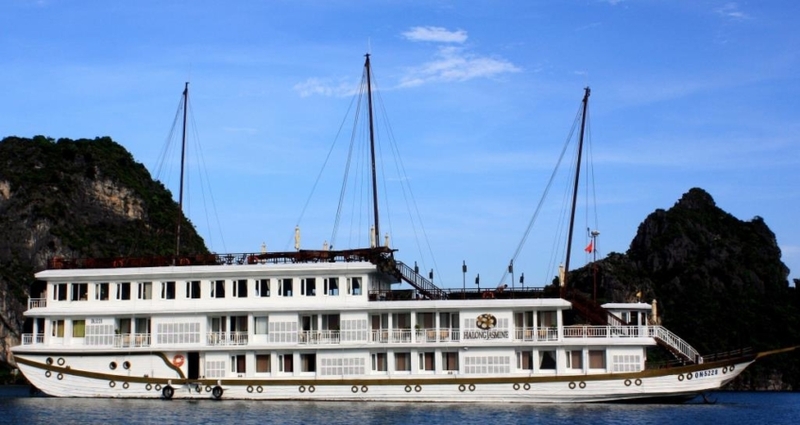 The boat begins to cruise around Ha Long Bay, within an hour you get to experience this magnificent site dubbed as a UNESCO World Heritage Site. The first trip aboard the ship is to the famous Tien Ong Cave. The cave measures at 2,000 sqm and has hundreds of stalagmites and stalactites. The cave was formed by the tectonic movements of limestone formations 700,000 years ago. The cave is situated four meters above sea level. This trip lasts for 20 minutes (it is highly encouraged to avoid wearing high heeled shoes for this trip). The journey continues to the oldest fishing village in Halong Bay, the Cua Van fishing village. A small boat, maximum of four persons, will take you to the fishing village where you will see floating schools and houses. Experience the life of the locals as you watch them fish and go about their business in their floating houses. After experiencing local life, guests return to the ship and get a chance to hone their cooking skills at the cooking class onboard. The class will be held by a Vietnamese chef. You can lend a helping hand at any given time and try your skills at creating Vietnamese dishes. 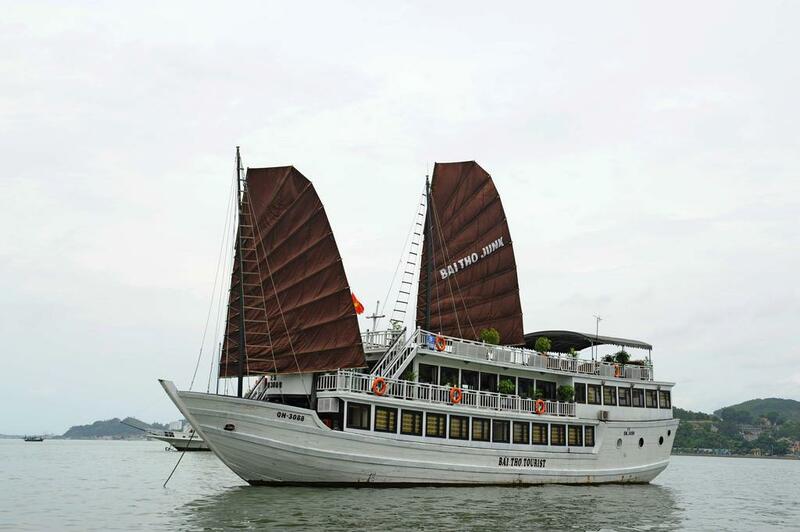 The boat cruises slowly so that you can enjoy the many hues of the sunset on halong Bay. You can also enjoy a soothing massage or have a drink on the terrace deck while enjoying the sunset. 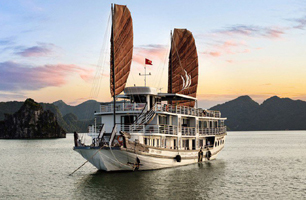 At 19:00, guests can attend a sort presentation about Halong Bay before dinner is served. 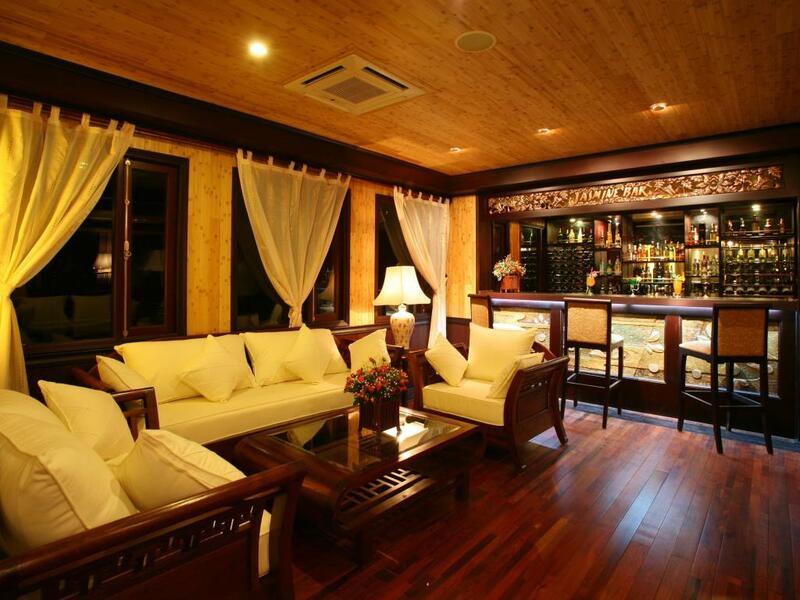 After dinner, you have the night to yourself to sit back on a comfortable sofa as you experience the beauty of Halong Bay while sipping your favorite wine. 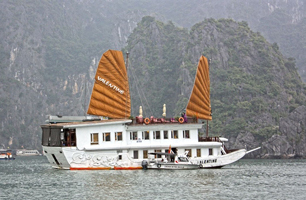 Not a lot of destinations in the world offer the experiences you get on Halong Bay. 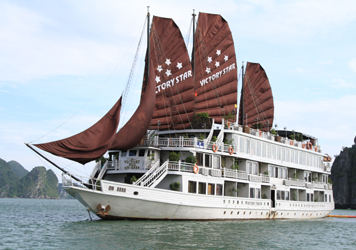 The boat anchors at the right spot where guests can enjoy the sparkling stars bathe Halong Bay with light. The view of the other boats, the calm waters, and the sparkling stars are a perfect backdrop for your dreams of the Bay, where dragons once roamed. For those who wake up early there is complimentary coffee, tea, and pastries are served followed by a tai chi class on the deck at 7:00AM if you are inclined to join. Tai chi is a great activity for relaxing and experiencing nature. After a delectable breakfast, it is time for a dip in the emerald waters of the bay. Via tender boat, guests are taken to a white sand beach where they can enjoy the crystal waters. 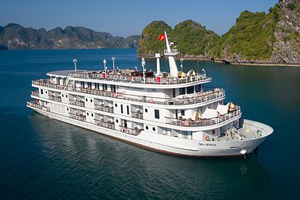 Sporty guests can climb up the hill for a spectacular view over Ha Long Bay before we head back to the ship and cruise to Halong City, cruising through beautiful locations such as Poem Mountain, Ti Top Island, and Tam Cung Cave. During the cruise back to the city, guests are treated to a buffet brunch before docking at approximately 11:00AM. The crew will say goodbye and you will disembark on Royal Park Pier. Our car waiting there then take you back to Hanoi. In the morning, the crew of the Sunset welcomes all guests aboard the Violet, Ginger, and Jasmine. 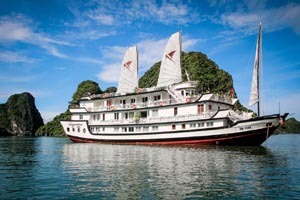 Breakfast is served in the restaurant while the Sunset cruises slowly into Halong Bay then straight to Catba Island. 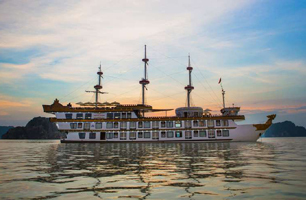 Be amazed by nature as the Sunset cruises in this spectacular area of Halong Bay. We arrive at the dock of Viet Hai and ride a bike along the dock through a stone tunnel and forests to the village. We then discover the village as we go through traditional houses and meet residents. 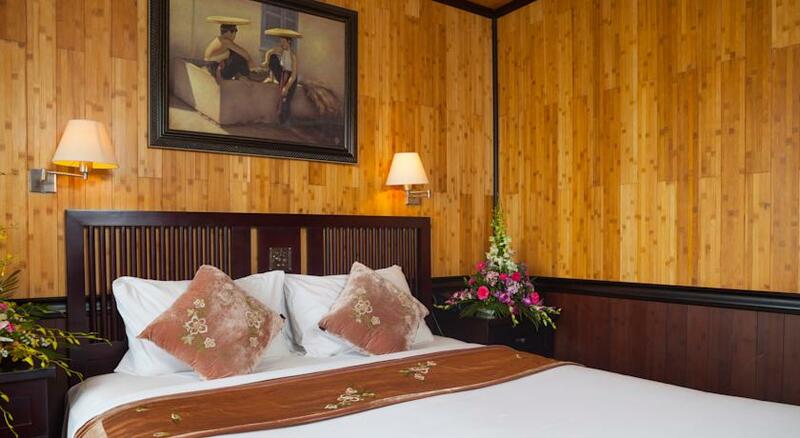 Guests can opt to take a leisurely walk to the nearby jungle. The adventure then continues to a local elementary school. An unforgettable way to spend time with the children is to become a substitute teacher or sing a song. After the visit to the school, guests ride a bike back to the dock and return to the junk ship. The cruise resumes its course to Ho Ba Ham. During the slow cruise, lunch will be served. At this location, guests can enjoy kayaking to magnificent rock formations and islets or row through water tunnels. Guests can jump right into the lagoon from the ship or go to a beach to bathe. After exciting activities, return to the ship and relax on a bench on the sun deck. Once back aboard the mother ship, relax in your room for a second night on Ha Long Bay. In the morning, the crew of the Sunset will welcome all of the guests from the Violet, Jasmine, and Ginger. A scrumptious breakfast is served as soon as the guests are settled. 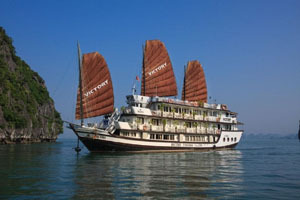 Guests can enjoy breakfast while experiencing the natural beauty of Halong Bay. 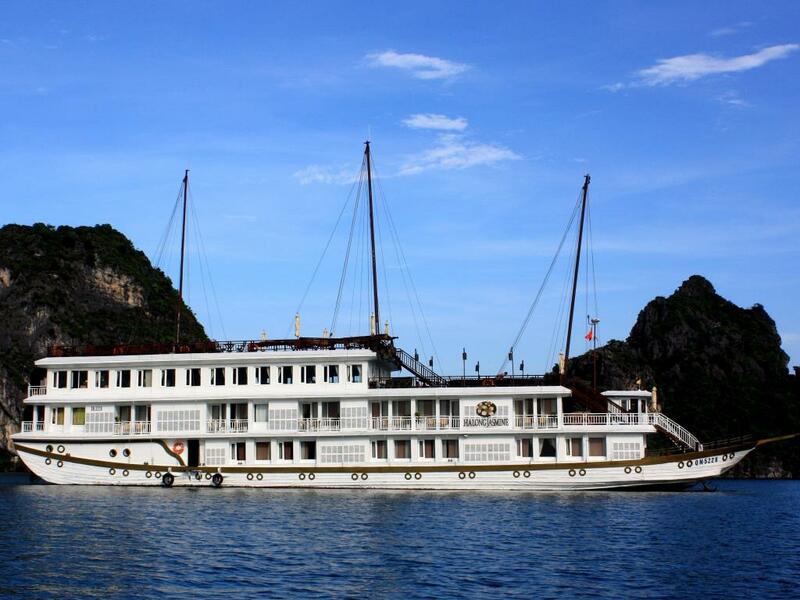 The Sunset cruises into Ha Long Bay then proceeds to Cat Ba Island. 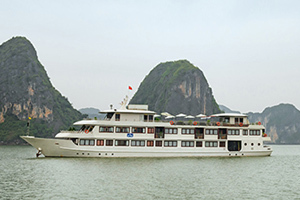 Even if the weather is bad, Ha Long Bay still offers spectacular views and picturesque landscapes from the sun deck. Swim and kayak around Hai Quan Lagoon and get up close and personal with the many islets and rock formations on the Bay. Before lunch, we head to ‘Surprise Cave’. Lunch is served aboard the Sunset’s restaurant. After eating lunch, guests enter the ‘Surprise Cave’ or they can enjoy kayaking around the Luon tunnels. 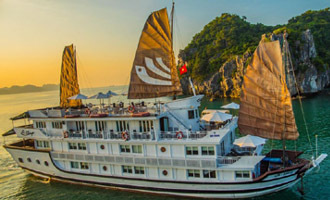 IN the afternoon, the Sunset returns to several breathtaking sights along Ha Long Bay such as Dau Xuoi Channel, Soi Sim, Toad Islaet, and Cua Van Fishing Village among others before returning to the mother cruise ship for another night. Shoes, water bottle for cycling, first aid kit, torch for the caves, helmet for biking, rain coats (if heavy rains, occur biking is cancelled), kayaks with paddles, and a life jacket. 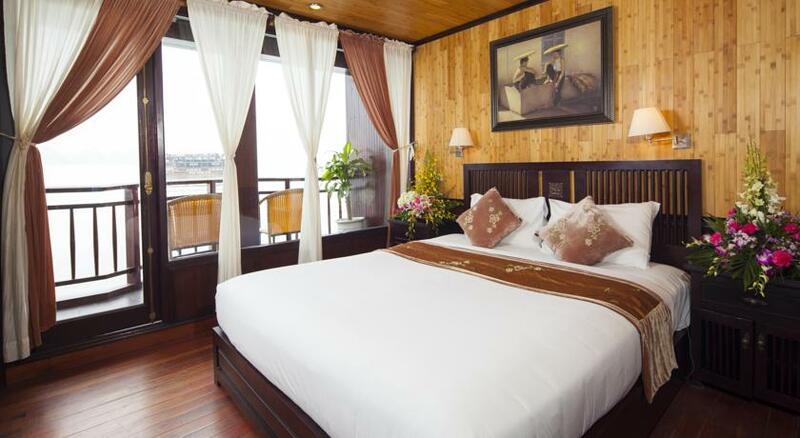 For visitors who would rather skip biking to Viet Hai, you can enjoy walking along the dock and water front, get a spa aboard the ship, go fishing, or enjoy a cooking class from the chef.